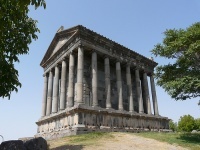 The Greco-Roman Garni Temple is a popular tourist attraction, putting the small, rural village of Garni on the map. This 2,000-year-old building was constructed out of basalt on the banks of the Azat River and was the summer residence of the Armenian Kings, featuring constructions like a two-storey royal summer palace, a bath complex, a church, a cemetery and a Greco-Roman temple built in the Ionic style. While much of the temple was destroyed in the ensuing millennia, it was restored to its former glory in the 1960s. Archaeologists are still working at the site, and many artefacts have been uncovered.